I've just caught up on the last 3 or 4 episodes of the show and WOW! I thought it was odd too that Leah's mother was allowed to be in with her. My only thought on this is there there is an OT3 course room and if you've already gone through OT3 maybe you are allowed in? Either that or it's celebrity privilege. I may be completely wrong, but I got the sense that Vicky was directed to be in the room to 'handle' Leah's (anticipated) reaction. There are so many accounts here written by people who've done the various OT levels, and I've not ever before read one that mentioned another person nearby. My thought is that it is absolutely a celebrity privilege. As far as I know, and I guess I can allude to (and suppose I am alluding to) the fact that I do know, that celebrities are given a different Scientology than public, almost always. They do not receive what "we" as public know as "standard" tech. The rules are bent quite unbelievably in fact for celebrities. Sometimes they are aware of this and sometimes they don't even know it. Thank you. You will now not be incinerated. Calm down Drogon, we'll find you another dinner. "For every story we tell there’s a hundred people that contact us. And that’s just people contacting us. You can imagine how many thousands more have been affected by it throughout time." It's great to see you posting again @JBWriter. The Xenu story is read in the OT3 course-room which could have many people in it and then (if the person is able to walk while convulsed with laughter) they totter off and start to audit the level in a completely private auditing room ... I agree with you that Vicky may have been allowed in the course-room to "handle" any issues Leah may have had (assuming she wasn't there as the supervisor) but there could have been a lot of people in the course-room. 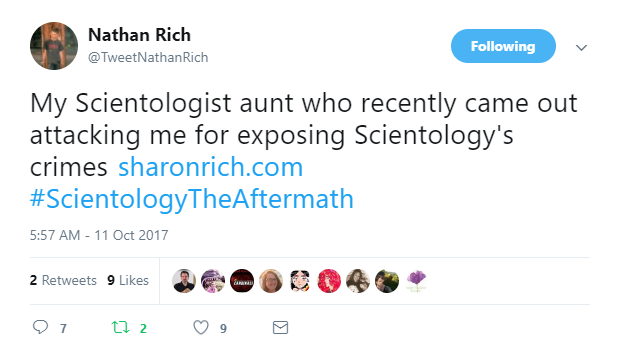 Whether it was "okay" or "not okay" for Vicky to be in the room with Leah, the fact still remains that celebrities get special treatment, even if that means they receive a different Scientology, standard or not. Just watched the "celebrity" episode with Paul Haggis. Loved the ending with Haggis calling out the celebrities (in general), along with the photos of the most famous ones (except TC?). Has anyone made a note of each of them? I recognized all of them, but there was one woman I wasn't sure who exactly she was. The latest episode of Leah Remini: Scientology and the Aftermath focused on the treatment of children in Scientology, something the show has touched on before. In Scientology, children are viewed as equal to adults, and therefore responsible for their actions in the same way adults are. "A child is a man or a woman who has not attained full growth," L. Ron Hubbard wrote in The Scientology Handbook. "Any law which applies to the behavior of men and women applies to children." But the stories from two former students sent to a Scientologist-run reform school allege corporal punishment, manual labor, and other poor treatment. Saina Kamula was on the first episode of Season 2 Scientology and the Aftermath. Her story touched many but there is much more to tell that TV time doesn't allow. Join us as we discuss Sainas entire story with a few really incredible insights from a very brave hero anyone trying to escape Scientology and find justice. What is it like when there is a Suicide attempt? How is Saina coping post Aftermath? AND What happened with the charges filed on Aftermath? Find the answers to these questions and more on this edition of Come Get Sum Extra!! Don't know if this has been posted but this is Leah Remini telling her experience of doing OTIII to Joe Rogen. Leah Remini took to Instagram to talk about her feelings of shame over the discovery of several photos and items that link her to her Scientology past, sharing these intimate pics with fans along with a heartfelt caption where she talks how “embarrassed” she is over her past as a member of the religious organization. The actress posted two photos; one where she and her husband, Angelo Pagan, posed alongside the Chairman of the Board of Scientology David Miscavige and another of several awards the couple received for their work to help promote the religion via the donation of large amounts of money. Throughout her time as a practicing Scientologist, she had what she alleged were “many nights” of being “harassed and hounded” to give over large amounts of money because Scientology was reportedly “saving the world” from discrimination, bigotry, crime, and hate. Of course, on this Hubbard is correct. All grown men and women babble in a strange language, regularly puke up their liquid breakfast and pee and poo in their pants.